Discussion in 'Bonus Spins - Extra Spins - No Deposit Bonuses' started by Marina, Dec 5, 2013. 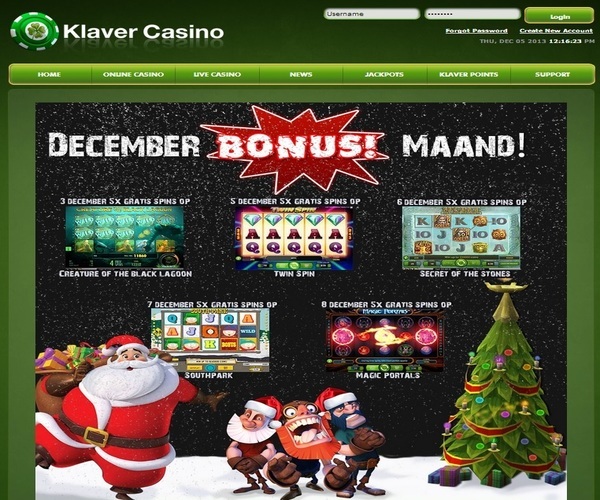 Have you seen the nice Christmas Calendar from Klaver Casino!? Players who deposited and played for real money at Klaver Casino in the past 2 months can get 5 FREE Spins ! Today, December 5th, you will find free games on the 243 ways online slot TWIN SPIN ! Free Spins will be available beetween 14:00 and 23:59 CET. Terms and Conditions from Klaver Casino apply. Today you can find 5 Free Games on the Secret of the Stones at Klaver Casino. In order to receive the free spins, you must have made a deposit within the last 2 months. Good Luck everyone with the 5 Free Games. Today there are 5 Free Spins on the Video Slot Muse for active Klaver Casino Players. Love the stacked wilds with this one. December 17th 2013 brings you 5 free spins on Thief slot video slot. Good Luck friends at Klaver Casino. Free spins continue at Klaver Casino. Free Spins will be available between 14:00 and 23:59 CET. I really like the Disco Slot. Good Luck everyone with the 5 Free games and thank you Klaver Casino for the free games once again. Grab your 5 free spins on Lucky Angler at Klaver Casino for Friday, December 20th. Klaver Casino gives you for today 5 spins on Jack and the Beanstalk slot! This is one of my favorite Netent Slots!